Melt 2 cups rendered suet or lard with 2 cups peanut butter in the microwave. 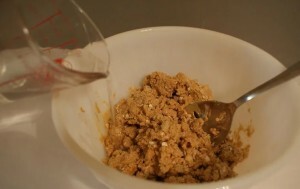 Allow the peanut butter and suet/lard to cool before mixing with 4 cups cornmeal or oatmeal. Add warm water. Be careful not to add too much, or the dough will turn gooey and messy. Add 2 cups birdseed (mixes are good) and/or dried fruits (raisins, currants, cherries). Use square containers a little smaller than your suet holder. Pour in mixture and cover with plastic food wrap. Freeze for 24 hours. This makes 9 cakes.